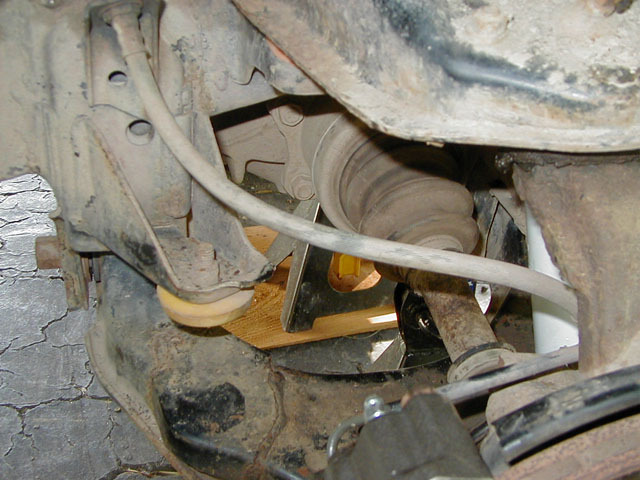 Keeping your vehicle's brake system in optimal condition is obvious for safety reasons both on and off road. In this article, we will walk through some basic checks of the system, along with bleeding the brakes and checking for proper operation. Visually check the three system rubber lines, and also feel them for any abnormalities. The junction of lines on the forward passenger frame rail can be inspected for leaks. Inspecting your brake system takes just a few minutes and should alert you to any potential problems before they occur. A visual inspection should be done at each oil change, while checking the pads, rotors, shoes, and drums can be done less frequently. To start, check the color of the fluid in the master cylinder: this can be the earliest warning to impending problems. The fluid should be clear, almost transparent. If it is turning brown, the fluid may be beyond its useful life. 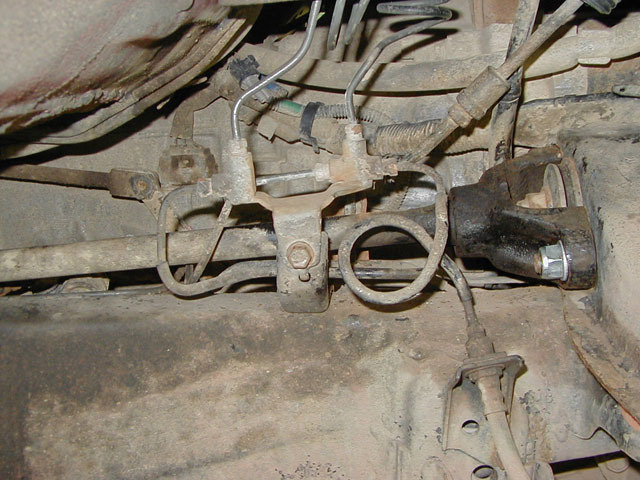 On the Toyota pickups and 4Runners, there is a rubber line to each front wheel caliper from the frame, and a rubber line from the load sensing proportioning valve (LSPV) to the rear axle. These rubber lines should be firm yet mildly pliable, with no obvious bulges, cracks, or leaks. The junction of brake lines on the passenger side frame rail just aft of the motor mount should also be inspected for leaks. The LSPV can be found on the passenger side frame rail above the rear axle and it too should be inspected. Finally, trace the hard line from the junction to the LSPV, particularly around the gas tank, for any corrosion. Regular blasts with a garden hose will help keep debris buildup, and subsequent deterioration of the hard lines, to a minimum. Cautionary Note: Please be very careful any time you work with brakes. The dust from the pads, shoes, and rotors is extremely dangerous and contains asbestos, and the brake cleaning solvents tend to be quite toxic. Never work on brakes in a confined area: be certain there is plenty of airflow. Any time you work on or around brakes, you should regularly clean up the area and any exposed skin, and immediately wash your c lothes when completed. Due to our climate and the type of wheeling we do - road salt and mud are common - I clean my brakes after every wheeling trip. For those who don't see these conditions, less frequent cleanings should suffice. Remove one wheel at a time, and loosen up and remove as much debris or gunk as possible, being careful not to puncture the caliper piston seals or the rear cylinder boots. While the rear wheels and drums are off, spray the rear brake system with brake parts cleaner, making sure the adjusting bolt threads are clean. Don't forget to spray the drum and wipe it down to remove any accumulated dust or debris which could affect drum or shoe wear. This is also a great time to check the rear shoes for thickness (Toyota specifies 1mm minimum thickness), and adjust the shoes. 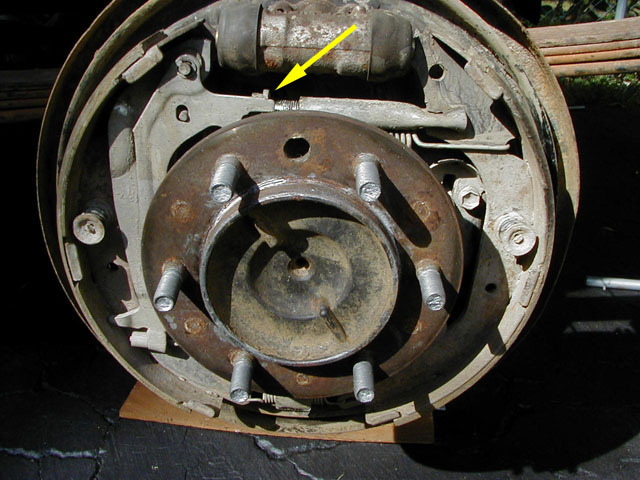 If additional rear brake service is required, please see Scott Wilson's article on rear brake shoe and cylinder replacement. After adjusting the rear shoes to within 0.5mm of the drums, the emergency brake should fully lock the rear wheels within 11 to 17 clicks on the lever. The rear shoes are self-adjusting, and the adjustment mechanism works best with the truck moving in reverse and applying the emergency brake. If you don't perfectly adjust the shoes at first, use this self-adjustment to get them right. Thoroughly clean the caliper and the vents in the rotor. When gummed up, the rear brakes don't self-adjust. The arrow points to the adjusting wheel. 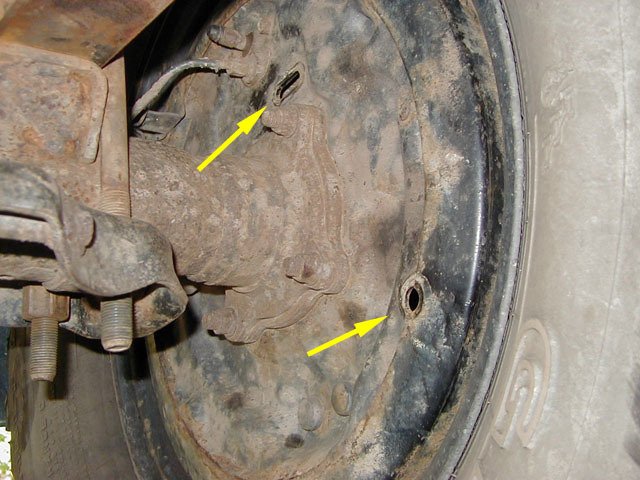 Rear shoes should be within 0.5mm of the drum. Rubber grommets can be removed from the backing plate to inspect (lower) and adjust (upper). 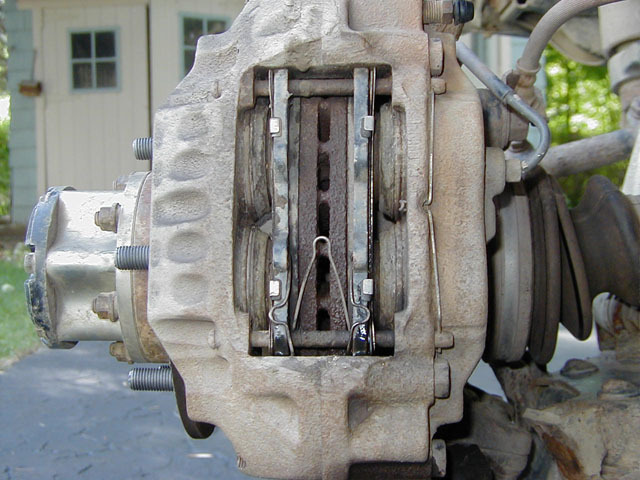 Mud and other road debris can ruin a caliper quickly, so they should also receive a good cleaning. Get any debris out of the caliper and the surrounding area, and also be sure to clean the vented slots in the rotors. The rotors cannot dissipate heat effectively when the vents are filled. Finally, check rotor wear and front pad thickness: Toyota recommends no less than 1mm of pad thickness. If pedal feel or stopping distance doesn't feel right, along with the checks of the rotors, pads, shoes, and drums it may be time to bleed the system. Moisture may be introduced into your brake system, and brake fluid will absorb it to prevent corrosion: but this also makes the fluid less effective. Bleeding the brakes should be done every other year, or any time you suspect diminished brake performance and have verified the remainder of the system is in optimal condition. There's a thousand products on the market for bleeding brakes, but I still find a single fitting, clear tube, and coffee can work well and can be done alone. Be sure to have plenty of fluid (check your owner's manual for specs on your vehicle), rags, and a 10mm flare wrench available. The proper order for bleeding the system is to start with the longest hydraulic line and work around the vehicle to the shortest line, and then do the LSPV last. So in this case, the order is: driver's rear wheel, passenger rear wheel, passenger front, driver's front, LSPV. The LSPV is bled last. 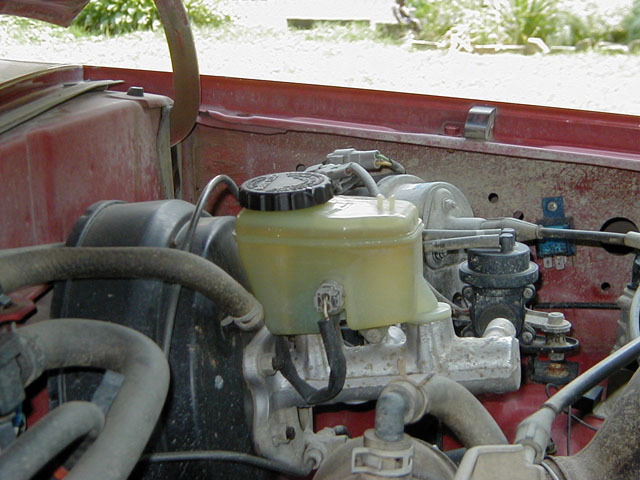 When completed, the fluid in the master cylinder should be clear. 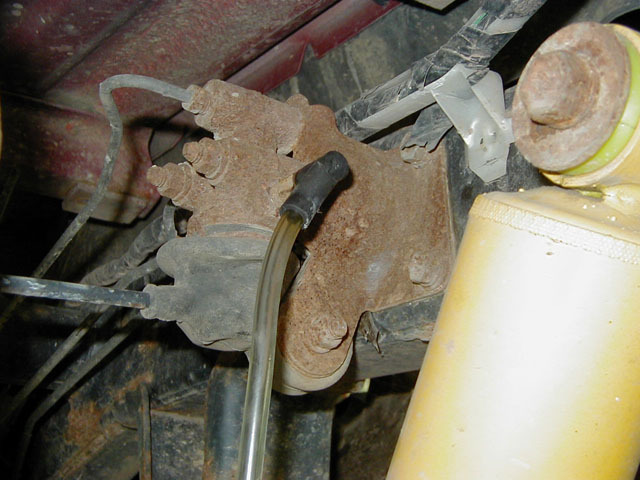 To bleed the brakes, pour some brake fluid into the drain can, and immerse the end of the tube in the fluid. Remove the rubber nub from the bleed valve and put the bleeder fitting and hose on the valve. Crack the valve open until a little fluid begins running in the tube, then begin pumping the brakes. I have found that with the hood open and working the pedal by hand, I can watch the master cylinder (which should never be run dry) and the condition of the fluid in the rubber hose. When clear fluid is streaming through the hose and no air is present, close the valve and proceed to the next wheel. Top off the master as required. Once the brakes and LSPV have been bled, check the system for air. Start the vehicle and step on the brake, then kill the engine and hold the pedal down. If the pedal does not sink after 15-20 seconds, the system is airtight. If the pedal does sink, the system should be bled until it is airtight.